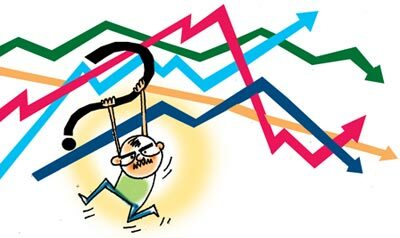 For existing investors, it may be prudent to redeem their current investments in gilt or dynamic schemes and invest it in short-term funds, if the exit load is not very high, advises Malhar Majumder. This calender year has been disappointing for debt investors. Some of them have even lost money due to volatility in the bond market. In the current interest-rate scenario, investors should put fresh money only in shorter-duration schemes. Existing investors should also move to a shorter-duration fund or credit opportunities funds to avoid further losses in longer-duration funds. The benchmark 10-year government security yield is on a secular upside and has increased in nine out of the past ten months. The benchmark yield was at 6.40 per cent in July 2017 and is currently at 7.79 per cent. AAA corporate bond yields too have risen sharply. The RBI's Monetary Policy Committee also increased the repo rate (the rate at which the central bank offers short-term credit to banks) to 6.25 per cent. The MPC, however, maintained a neutral stance. The decision to hike rate was taken against the backdrop of firming core-inflation and sharp rise in the price of crude oil. From here bond yields may react to a number of key macro variables, like the extent of rise in crude oil price, inflation, and the monsoon. But for the Indian bond market, one factor that is causing havoc to pricing is the scanty appetite of commercial banks for debt papers. The treasuries of these banks have lost billions of rupees in mark-to-market valuation over the past ten months and are hence shying away from taking fresh positions. Further exacerbating the problem is rate hikes by the US Fed. It is impelling Foreign Institutional Investors (FIIs) to sell rupee-denominated bonds. Between January and June 2018, FIIs have withdrawn Rs 414.34 billion from the Indian debt market, which is in stark contrast to their net inflows worth Rs 1.49 trillion in the Indian market during 2017. As selling is significantly more than buying, not only are bond yields moving up, there is also a significant amount of foreign currency outflow from the country. This is a key factor besides the spike in oil prices that has made the rupee the worst performing currency in Asia in 2018. All these factors combined are imposing upward pressure on bond yields. We have seen a secular rise in yields for the past ten months. It is difficult to predict when and at what levels yields will stop rising and when they will turn around. As the gap between 'bond yields' and 'equity earning to market capitalisation' is widening, bonds with a shorter duration -- those having a maturity up to two to three years -- have started offering some value. It is not the time to play the duration game as yields remain volatile and may move higher up to compensate for changes in macro variables. Also, given that we are in a rising yield environment globally, duration is something that investors should stay away from. Usually, a debt fund that invests in central government dated securities plays on duration. These funds are categorised under 'medium and long duration gilt fund' by the Securities and Exchange Board of India's circular on Categorisation and Rationalisation of Mutual Fund Schemes. Dynamic bond funds also invest in instruments across duration, and investors should avoid these funds for the time being. Investors in dynamic bond funds and gilt schemes would have already lost money over the past one year. If an investor holds a fund with a duration of, say, eight years, in case of a 25 basis points increase in rates, the fund value may decline by 2 per cent (approximately). For existing investors, it may be prudent to redeem their current investments in gilt or dynamic schemes and invest it in short-term funds, if the exit load is not very high. A yield curve is a line that plots interest rates, at a particular point in time, of bonds having equal credit quality but different maturities. According to risk-reward norms, returns should be higher for longer maturity bonds, and yield curves should slant upward. But that isn't the case right now. The risk-reward equation is skewed towards shorter-horizon securities, which are offering better risk-adjusted returns. An investor should park his contingency money in liquid funds and the rest of his debt fund investments in short-term fund. It is best to opt for a fund that matches your investment horizon. Ultra-short-duration funds, for example, have a portfolio maturity of three to six months, while short duration funds are required to keep a portfolio maturity between one year and three years. Investors may also look at closed-end fixed maturity plans (FMPs), which are getting launched in the market, based on their investment horizon. These closed-end funds invest and hold securities until maturity. Do look at the securities that an open-end fund holds before investing in it. To chase high returns, a fund may be investing in bonds with lower credit rating. An investor must check the list of companies where the fund has invested and their repayment track record. It is also useful to diversify your investment among more than one fund and conduct regular health checkups. Credit opportunities funds (or credit risk funds, as they have been categorised in the SEBI recategorisation circular) are an alternative for investors willing to take higher risk for slightly higher returns. These funds invest in debt securities issued by a company, whose credit rating may improve in the near future. If the call is right, the investment appreciates in value. This is beside the coupon paid by the securities. The current yield to maturity (YTM) of these funds is between 8.8 per cent and 10 per cent. The higher YTM can be attributed to the fact that these funds invest in lower-rated securities, which offer higher yields. Credit opportunities funds are not duration but credit play. Given the number of credit defaults happening across sectors like telecom, real estate and power, investors should be choosy about these funds. Opt for a fund that has AA+ or AAA-rated papers. Malhar Majumder is partner and consultant at Positive Vibes Consulting and Advisory. Market crash: Worried about your MF investments?